Cape Town is the setting for this Afrikaner coming–of-age novel. Renee Pretorius has grown up on a farm in the dry expanses of the Karoo. Deeply immersed in the mores of Afrikanerdom, she accepts without question her family’s ideas about race, ethnicity and social class. All English are suspect, Coloured people are racially inferior (but can make good servants), and Blacks are the dangerous, untouchable other. However, when the topic is ballet, Renee thinks for herself. She decided at six to become a ballerina. Now at age 17, she has persuaded her parents—despite their reservations—to let her study in Cape Town. She boards the Trans-Karoo Express and embarks on her new life. In Cape Town, the social barriers Renee’s parents have erected in her naïve mind immediately begin to crumble. The first person who genuinely befriends Renee is Dion, a Coloured gay dancer. Within weeks she falls in love with Andy, an English human rights activist. Renee’s transition from adolescence to adulthood is framed by historical events taking place in Cape Town as the Black majority—standing on the threshold of freedom —surges forward to create a new South Africa. The novel spans one year in South African history, from February 1989 to February 1990. During this crucial time, the country’s Black majority population—aided by allies—finally breaks the bonds of apartheid. The wider world has sanctioned South Africa and South Africans interested in change are more active than ever before. Cape Town is a hotbed of resistance as township people, university students and women of the Black Sash take to the streets in protest. Songs by Johnny Clegg (the “White Zulu”) and Sipho Mchunu play on the radio. People do the steps of the toyi-toyi protest dance and the notorious necklacing of suspected traitors brings fiery death in the townships. The police shoot tear gas at students, provoke violent confrontations, make sweeping arrests, and hunt “communists” and “terrorists.” As Renee witnesses the mounting evidence of a police state, she has to decide where and with whom she stands. The novel includes a cameo appearance by Archbishop Desmond Tutu. Nelson Mandela, the soon-to-be president of the country, is still incarcerated but rumors of his release abound. The novel is rich in symbolism. The train that brings Renee from the Karoo to Cape Town is symbolic of the migration of many Southern Africans from the countryside to the city, from the early gold miners to contemporary actors, musicians, and dance artists. Renee’s story could symbolize every aspirant’s story, where persistence pays off and leads to a new outlook on life. Most importantly, her experience of family estrangement due to a forbidden love relationship has been the case with many in South Africa. Hammond crafts a good story. Her writing is subtle yet visual and sensual. A first sexual experience, betrayal by a friend, even the consumption of good food are deftly portrayed. The book has a clear voice, realistic plot, and complex characters. Renee’s transformation from a racist to a liberal is slow and incomplete. One suspects that like many White South Africans her personal evolution will be lifelong. The publisher has classified the book as a young adult novel but it will be interesting to adults as well. Highly recommended. 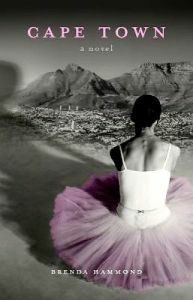 I really enjoyed this book, especially since I have visited Cape Town and could visualize the surroundings. I do have a serious concern, however, about the book and the review. The love story is very sweet and seems realistic (in a general way) to me. The main characters are sexually active; the young man is older and more experienced. Yet there is no mention of birth control, the risk of pregnancy, or HIV and other sexually transmitted diseases. I believe that this lack is unrealistic, and highly irresponsible, since this is a YA novel. Given the recent history of South Africa and the rates of HIV and AIDS, the omission is particularly egregious. Where are the condoms? Where is the worry about a pregnancy? Is this the author’s or the publisher’s lack of courage because of a South African market? Of the American schools’ market?